HICKORY, N.C. & ESPOO, Finland--(BUSINESS WIRE)--Building on previous collaboration, CommScope and Nokia have teamed up to develop a solution to reduce the interface complexity between a base transceiver system (BTS) and active distributed antenna system (DAS). Using Common Public Radio Interface (CPRI*), the new solution will remove the need for the radio heads normally needed to feed an active DAS, hence reducing the space and power requirements of an active DAS. 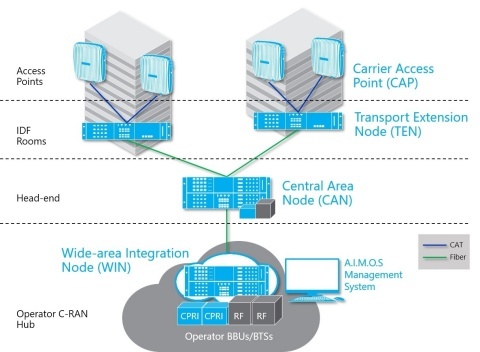 The CPRI interface will link Nokia’s AirScale baseband unit to CommScope’s Era™ C-RAN antenna system and will dramatically reduce the time, space and power required to connect subscribers in high-capacity public venues and enterprises. This new agreement builds on the companies’ previous, successful co-development work. “The benefits of a CPRI solution have already been well-established in distributed antenna systems—a much smaller headend unit is easier to deploy, uses less power and saves valuable room on-site,” said Matt Melester, senior vice president, Distributed Coverage and Capacity Solutions, CommScope. The interoperable CPRI baseband solution from CommScope and Nokia removes the analog conversion stage, keeping the whole system digital until the distributed antennas. CommScope and Nokia expect to make the new interface solution available in mid-2018, and for it to be interoperable with the CommScope ION®-E distributed antenna system in addition to Era. *CPRI is a specification for the communication link between radio equipment controller units, typically known as baseband units, and remote radio heads. CommScope Era is a trademark of CommScope, Inc. ION is a registered trademark of CommScope, Inc.
CommScope and Nokia have teamed up to develop a solution to reduce the interface complexity between a BTS and active DAS.